Biologists define Longevity as the average life span of an individual under absolute conditions. In lay man terms, it is defined as - long life, a great duration of life. Goal Of Longevity : Striving for the maximum potential age along with a healthy life. When we say maximum age, we do not mean, just living on and on for many years. QUALITY OVER QUANTITY -is what we have been looking on for all these years in almost every aspect of our lives. So how can we overlook this quality, when it comes to our health and life? Achieving longevity without Vibrant Health would be nothing more than a "Pyrrhic Victory". Such a long life would be as nugatory as the living dead. Imagine, living a long, unhealthy or diseased life, full of sufferings - ' The Nagging Pain ' is all you will get out of such a miserable life. All you would do is, just live for the heck of living and wait for your impending death to put an end to the long standing agonies. The goal of longevity, thus, goes hand in hand with the idea of a vital, happy and healthy life. 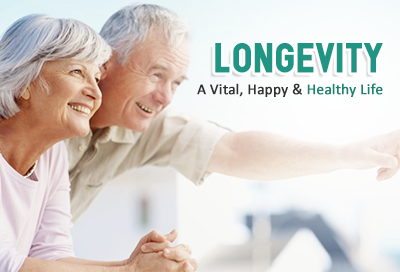 Infact, enjoying an excellent state of health is the crucial factor in achieving longevity. Having said that, would you wish for longevity without quality? Some of us think that our genes determine our longevity, but, the truth lies in the fact that genetics account for a maximum of 30% of our life expectancy. Now the question arises, where does the rest come from? It is not just a matter of longevity genes, but rather one’s ability to resist the diseases – the strength of the immune system, the ability to make efforts for one’s own health (by feeding body with wholesome and nutritious food, ditching the bad habits, not exposing your mind and body to stress, get proper rest, prevent occurrence of diseases ) - this is what determines longevity. For death is uncertain, is inevitable. This might leave you mystified. But trust me, if you have lived your share of a long, healthy, vital and happy life, you have managed to live your life to the fullest. Once you satiated with your life, your perception about death will entirely change. If whatever stated above, is achieved, who would fear death ? The idea of Death never gave me creeps (Death- a universal truth), but the thought of it, is what scares me. Most of you, reading this article will be able to relate to the idea. And, No matter, how positive we might seem about life, but when the word Death is introduced, it leaves a frown on most of our faces. Put in efforts to make your life happy, vibrant, long and a healthy one. For, we live only once right? So give it your best shot. Ultimately, life is how you make it. It’s your choice how you live it. Even I am no expert when it comes to life and no one really is. Its all about choices, they do make a difference. Dear Nitin It is absolutely okay. Its not too late and lemme tell you,that majority of our population is not aware of the worth of their healths. We keep denying ourselves the chance to feel energetic, alive, balanced and healthy. No worries,you can still attain the perfect health. There is no specific age for desiring for Vibrant or what we call the perfect Health. No age can limit your desires, right ! Same is the case with Health. We do not need to go to any Vibrant Health Clinics or Wellness Centers or Institutes to achieve it. All you need is a few herbs and combinations to set your body right and there you go, you can achieve the state of health you've always dreamed of. Look up in the Vibrant Health Portal,coming soon to answer your other queries as well. Stay Healthy !!! Your article motivates towards changing my perception of healthy living. I wish, i had read this article 10 years back. At age 40 and with years of abuse to the body. Is it still possible that i can attain perfect health? Rupinder, Thank you for the write up. You have prompted me to think on the subject. It is really a wake up call. We must think on these line. I will try and change my attitude, but is there something I can do to enhance the quality of my life. Like is there a pill for it.